Last year for the Venice Architecture Biennale STEALTH.unlimited (Ana Dzoki and Marc Neelen) with Saskia van Stein from the Netherlands Architecture Institute curated the Dutch Pavilion with the project 'ARCHIPHOENIX - Faculties of Architecture'. Their response to the overall topic 'Out There: Architecture Beyond Building' was triggered by the burn-down of the Faculty of Architecture in Delft (May, 2008). Instead of thinking in terms of an exhibition, the Dutch Pavilion was turned into a stage for research and exploration and a debate platform focusing on faculties for architecture - in the sense of its multiple capacities, powers, capabilities. the pavilion, which changed on a daily basis to accommodate the line of activities and an on-site instantly edited video and book production unit. While the pavilion has been acting as a temporary 'school', the produced content aimed to become an imaginary curriculum for architecture beyond division on education and practice. In Stacion - Center for Contemporary Art Prishtina, Ana and Marc will talk about the Venice experiences and also introduce topics and issues that wil relate to their contribution as co-curators to the upcoming Tirana International Contemporary Art Biennial, to open in September. This year, for the first time the Biennial will introduce a focus on spatial production under neo-liberal conditions in the cities in the region and on their condition as an echo of global forces. 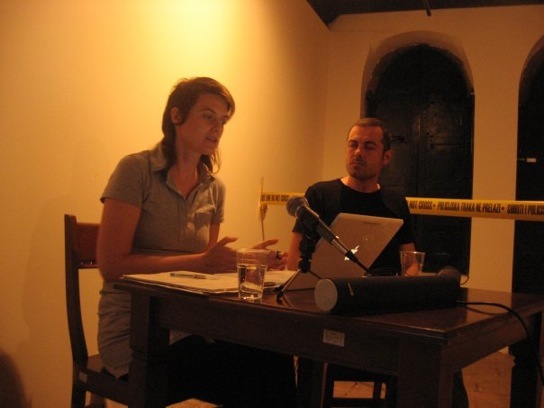 Ana Dzokic and Marc Neelen collaborate since 2000 in STEALTH.unlimited, a practice based between Rotterdam and Belgrade. Their projects deal with the complexity and inconsistency of the contemporary city, like Wild City (Belgrade), Urban Catalyst (Amsterdam), Challenging the Conservative Brain (Kunstverein Munich), Cut for Purpose (Museum Boijmans van Beuningen, Rotterdam), Lost Highway Expedition (Western Balkans). In their work shifts of perspectives, from visual culture, urban research, spatial intervention, to cultural activism - are a key element. By creating devices that can take the form of a specific intervention in physical space, an occasion for exchange of knowledge, but also a piece of software, they produce test conditions to probe the shared authoring of urban space and culture.